Social media provides a strategic means for non-profit organizations to build and maintain strong relationships with consumers. The purpose of this study was to apply branding theory and frameworks to the use of Facebook by National Olympic Committees in two countries, Australia and Canada over specific time periods related to three Olympics Games. These Facebook pages were examined to determine the types of brand-related post content and communication style utilized as well as the consumer response to these posts. The two organizations generally used Facebook to broadcast product related brand attributes such as information about athletes and teams. There was also a significant difference in Facebook post use and focus by two organizations indicating some international differences in using Facebook for branding a sport organization. The results also provide practical implications for non-profit sport organizations using Facebook to build positive brand images, promote fan engagement and ultimately create brand ambassadors. The rise in use and popularity of the Internet has dramatically changed the way sport organizations communicate with their stakeholders (Pedersen, Miloch, & Laucella, 2007). Social media (SM) platforms such as Twitter and Facebook provide a central location for social engagement and a means for sport organizations to disseminate their messages directly to mass audiences (Pegoraro, 2010). A SM usage survey of sport fans found that 40% report that SM has made them bigger fans of their respective teams (Broughton, 2011) confirming findings from an earlier study that 61% of Major League Baseball (MLB) fans and 55% of National Football League (NFL) fans considered themselves bigger fans of the leagues since they started following their favourite teams on SM platforms (Broughton, 2010). Additionally, 51% of MLB fans and 43% of NFL fans reported spending more time watching the league as a result of following their favourite team on SM (Broughton, 2011). Therefore interacting with sport organizations or other fans on SM can increase a fan’s level of identification and loyalty. As SM use has grown marketers have come to see it as a viable medium grow brand awareness (Dittmore & McCarthy, 2014), which is a key component of building brand equity for a sport organization, as without awareness the consumer cannot form a brand association. Research has established the link between brand awareness, association and brand identity to enhanced loyalty among consumers and sports fans (Aaker, 2007; Bauer, Stokburger-Sauer, & Exler 2008; Gladden & Funk, 2001; Keller, 1998; Ross, 2006). Brand loyalty involves building a two-way collaborative relationship through communication and interaction between organizations and their consumers or fans in the case of sport (Wallace, Wilson, & Miloch, 2011). SM use by sport organizations is largely driven by two key factors: the relatively inexpensive cost of SM when compared to traditional marketing tools and the ability to connect with millions of fans with ease (Dittmore & McCarthy, 2014). SM allows for interaction, providing a unique channel of communication that shifts communication from one-way (e.g., television advertisements) to a more interactive method. SM is a cost-effective tool for building brand relationships through interactive dialogue between sport organizations and fans (Williams & Chinn, 2010). National Olympic Committees (NOCs) are one segment of the sport industry that could greatly benefit from SM, as these organizations are not-for-profit and operate on rather limited budgets when compared to those of professional sports. NOCs are responsible for development of sport and athletes in their respective countries and are largely funded through government and sponsorship revenue. While all sport organizations stand poised to benefit from SM, most NOCs and the sports they represent do not have budgets allowing for full utilization of traditional marketing outlets such as paid television, radio, print, internet, and outdoor advertising (Eagleman, 2013). Many Olympic sports can largely be considered niche sports, or those that do not receive mainstream media coverage on a daily basis (Greenhalgh, Simmons, Hambrick & Greenwell, 2011). Niche sports are relatively on their own and therefore they must create their own publicity, their own market share and fan base in order to survive (Greenhalgh et al., 2011). 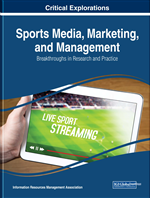 Eagleman, Pedersen, and Wharton (2009) found that while mainstream sports like men’s football and basketball in the United States, enjoy a mutually beneficial relationship with the mass media, it is much more difficult for other sports to generate awareness and build fan bases, and therefore they must seek channels other than mass media to achieve these goals.